Homa Hoodfar's richly detailed ethnography provides a rare glimpse into the daily life of Arab Muslim families. 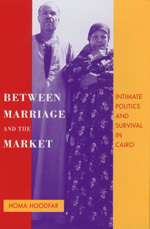 Focusing on the impact of economic liberalization policies from 1983 to 1993, she shows the crucial role of the household in survival strategies among low-income Egyptians. Hoodfar, an Iranian Muslim by birth, presents research that undermines many of the stereotypes associated with traditional Muslim women. Their apparent conservatism, she says, is based on rational calculation of the costs and benefits of working within formal and informal labor markets to secure household power. She posits that increasing adherence to Islam and taking up the veil on the part of women has been partially motivated by women's desire to protect and promote their interests both within and beyond households. Homa Hoodfar is Associate Professor of Anthropology at Concordia University.